The new Lamborghini V12 super sports car which will debut at the upcoming Geneva Motor Show (opens 3rd March to general public) will feature an innovative and highly sophisticated suspension concept. The pushrod spring and damper concept was inspired by Formula 1 and tuned perfectly to meet the needs of a high-performance road-going vehicle. Together with aluminium double wishbone suspension and a carbon ceramic brake system, this lightweight chassis is another element of the unique technology concept in Lamborghini’s new flagship model. An extremely precise, indeed razor-sharp, driving feel accurately describes the soul of the newest and most powerful super sports car ever to bear the sign of the bull. This includes a steering system that can think its way through a bend adhering to the perfect line, a suspension that masters the ideal balance between race-car feel for the road and plenty of comfort for ramping up the miles, and lateral stability that ensures absolute safety even at the very highest speeds. With its phenomenal engine output of 515 kW (700 hp) and its comparatively low vehicle weight, the new V12 super sports car from Lamborghini blasts its way to the very highest speeds. The most important characteristic of the new suspension is its design in line with the pushrod principle – inspired by Formula 1. The spring/damper elements are not located on the wheel mounts, but connected inboard to the body shell structure. They are transversely positioned: under the windscreen in the front and close to the engine in the rear. Pushrods and relay levers/rockers transmit the forces from the wheel mounts to the spring/damper elements. This solution offers a whole series of impressive benefits: due to the combination of the double wishbone and pushrod arrangement, wheel control and damper remain separate from each other. As a result, handling is more responsive and easier to manage at all speeds, while rigid connection to the chassis also improves the precise and spontaneous reaction of the springs and dampers. As a result, spring stiffness can be notched back a little – comfort increases, while precision remains. On the front axle, the shock absorbers are equipped with a hydraulic lifting system, which enables the front end of the super sports car to be lifted by 40 millimetres at the touch of a button, simplifying its ability to negotiate minor obstacles. Aluminium and carbon fibre are also the most important lightweight engineering materials on the chassis. The entire suspension system, including upper and lower control arms, wheel mounts and relay levers are made from forged aluminium alloy. The large-diameter discs on the high-performance brake system, on the other hand, are made from lightweight and extremely hard-wearing carbon ceramic composite material. On the front axle, the ventilated discs measure no less than 400 millimetres in diameter, with braking force delivered via six cylinder callipers. 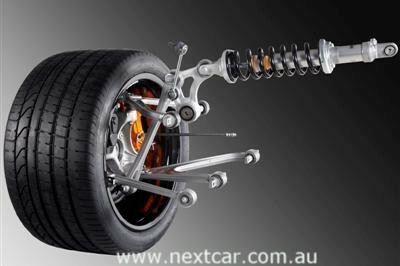 On the rear axle, 380 millimetre diameter discs are used in combination with four cylinder callipers. The parking brake on the new Lamborghini top model is electrically powered. The hydraulic steering on the Lamborghini V12 forms the highly sensitive connection between the driver and the super sports car, which runs on 19-inch wheels clad on 255/35 tyres at the front and 20-inch rims on 335/30 tyres at the rear. Steering Gear foresees 3 different servotronic characteristics managed by drive select mode. After all, not every day is the same and the “corsa” (race track) setting can perhaps sometimes be a little too demanding. Stay tuned to Next Car for additional details of this new Lamborghini over coming weeks.